You already know that fruits and veggies can boost your health, but can you promote your Shih Tzu’s Health with a carrot or green bean here and there? I wondered about that too. Should I buy commercially prepared supplements or serve a few extra fruits and vegetables. Which method would have the biggest bang for the buck? 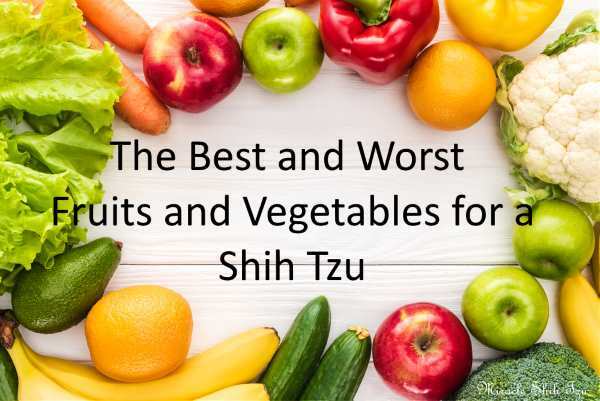 I started looking more closely into the nutrition I was providing my Shih Tzu dogs and discovered some interesting things about fruits and vegetables for a Shih Tzu. 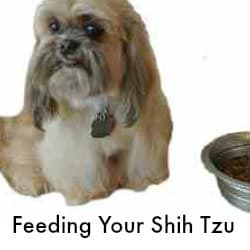 It turns out that there is evidence that you can boost your Shih Tzu’s Health by adding a few foods. The good news is that feeding your Shih Tzu fresh fruits and vegetables can help maintain blood sugar levels as well as increasing health in other ways. Why Offer Fruits and Vegetables for a Shih Tzu Instead of Store-bought Treats? Too many store-bought treats can lead to health problems for many dogs. There is very little information on many treat bag labels that let you know just what is in these so called treats. 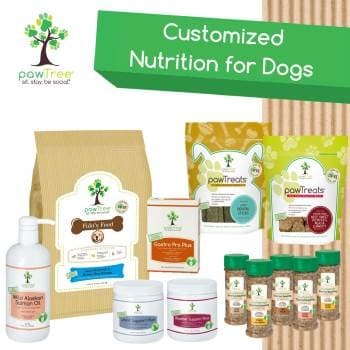 Many people will read and study their dog food's label but forget that the snacks and treats all contribute to the caloric intake and health of the dog. 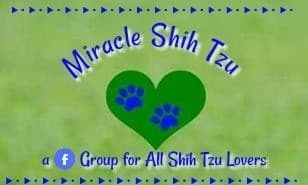 Loving Tzu owners may be feeding a high quality food and supplementing it with low quality treats. Instead of feeding your beloved Shih Tzu exclusively dry or canned dog food and store-bought snacks, giving them fruits and vegetables, whether cooked, raw or blended, can have significant health benefits for your pet. Substituting fruit or vegetables for treats for your dogs can offer a low calorie, healthy alternative to a highly processed store-bought dog treat. There are many types of fruit that can have surprising health benefits for your dog. The vitamins, minerals antioxidants, and fiber in fruit are all essential to a healthy diet, and a few chunks of fruit on top of dinner could be just what your picky Shih Tzu needs to entice him to eat. Shih Tzu dogs can eat a wide range of fruits but not all of those that people consume. Here are some that they can eat. Apples can be a great treat as well. They are rich with antioxidants, dietary fiber, and vitamins A and C.
Additionally, the hard texture of apples is good for healthy teeth, and can help eliminate bacteria. However, when feeding apples to your Shih Tzu, avoid giving them the core. For this reason, you won't want to give them the entire apple. If you have an older Shih Tzu with few teeth, consider applesauce as an alternative to hard raw apples. Shih Tzu can eat bananas, but they do have a high sugar content, so they should be offered in moderation. Bananas are high in fiber, copper, potassium, vitamins, and biotin, one of the B-Complex vitamins. You can also share a bite or two of cantaloupe with your Shih Tzu. Melons are low in calories and a great source of fiber and water. If you worry that your dog is not drinking enough water, this is my fruit that can help to hydrate him. The downside of cantaloupe is like bananas; it is high in sugar. Blueberries are another excellent fruit to serve as a treat. They’re considered a superfood and are rich in antioxidants which are essential both for dogs and people because the help prevents cell damage. Cranberries, both dried and fresh are OK for dogs to eat in moderation. Beware that dogs who love cranberries may end up eating too many which will cause an upset stomach. Some Shih Tzu dogs can acquire bladder and urinary tract infections as they get older. Just like humans, cranberries and papayas can both aid in staving off these uncomfortable infections. Peaches, either fresh or canned provide fiber and vitamin A. If serving fresh peaches assure that your Tzu does not get the pit. Peach pits, like many fruits including apricots, cherries, and mango contain cyanide. If you use canned peaches, check the label as many contain too much sugar. Never give your dog the whole fruit because even if they eat a small portion of the pit, the cyanide is very harmful. 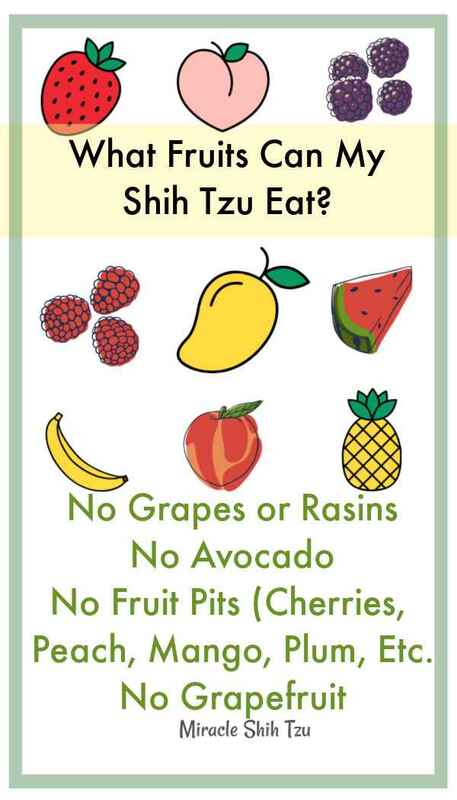 So, peaches and other pitted fruits are on the acceptable list of fruits and vegetables for a Shih Tzu, the pits are off-limits. In addition to those just mentioned you could give dogs pineapple, pears, raspberries, watermelon and strawberries, blackberries, honeydew melon, kiwi, and oranges. When considering fruits and vegetables for a Shih Tzu, many owners use Pineapple as a deterrent to dogs who like to eat poop. Pineapple tends to change the taste of poop making it less appealing to dogs. 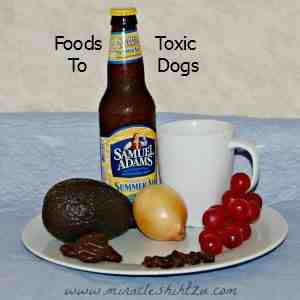 Many fruits are excellent for dogs but beware that some can be harmful. Avoid grapes and raisins, as even small amounts can cause kidney failure. According to the American Kennel Club, Avocados are another no-no. The outer skin, pit, and leaves contain persin, a toxin that causes vomiting and diarrhea. Even though the fleshy part contains less persin than the other parts, it’s still too much for dogs. Grapefruit is another fruit that dogs shouldn’t eat. Even though most citrus foods are fine, grapefruits can cause including vomiting, diarrhea, and depression. 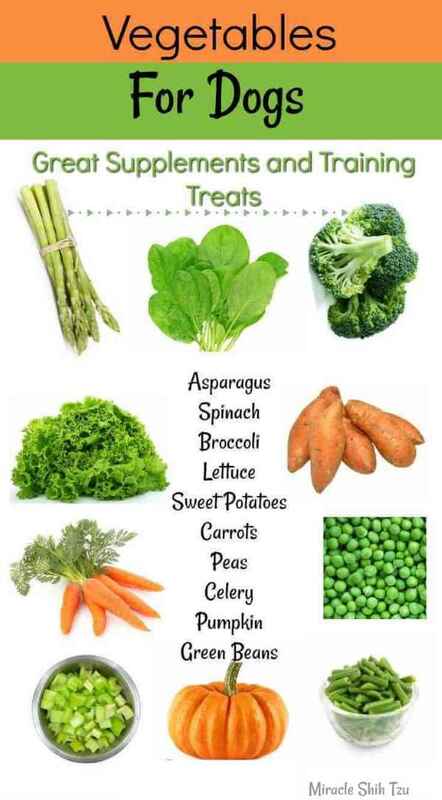 Hard, raw veggies can be a great alternative to traditional dog treats. Lower in fat and lacking in preservatives, carrots are a healthy treat that can promote good oral health for your pet. Carrots won’t leave any residue behind on your dog’s teeth, and their texture can help clean plaque buildup and other food residues, resulting in healthier teeth and fresher breath. Shih Tzu with their small mouth leaves them and often uneven bite are prone to dental problems later on in life. If you plan to use raw carrots as a training treat, be sure to dice them very small as most Shih Tzu puppies will spend time chewing them, thus defeating the purpose of training. Can Dogs Share Your Salad? Dogs can eat Green leafy veggies such as Lettuce, spinach, chard, cabbage, and kale. They are rich in vitamins A, C, and K, calcium, iron, and potassium, and are a good source of fiber. More Fruits and Vegetables for a Shih Tzu: Sweet Potatoes? Sweet potatoes can also make a hearty meal for your Shih Tzu when given in moderation. Shih Tzus tend to like sweeter tasting foods. Blending a cooked sweet potato into mush can lessen any negative impact on the digestive system, particularly in older dogs. Other root vegetables that Shih Tzu can eat include carrots, beets, and parsnips. Remember these foods are high in sugar and starchy so limit the amount you give your Tzu. Shih Tzu dogs generally love all types of squash, and they are safe for dogs to eat. Some squash such as pumpkin and butternut squash can work wonders if your dog has an upset stomach or diarrhea. Canned plain pumpkin is a great go-to treat when your dog’s GI tract needs a boost. You can even serve it on a spoon. Can Dogs Eat Legumes (beans, peas, lentils)? Legumes have been a staple in many types of commercially prepared dog foods, especially those that are grain free or have limited amounts of grains. This group of vegetables includes beans, such as kidney and pinto beans, lentils and peas. If you are considering adding legumes to your dog’s diet, you will first want to examine the dog food he is eating for the presence of legumes. Legumes have come under scrutiny recently with an FDA update reporting on the rise of canine dilated cardiopulmonary (DCM) in dogs eating foods containing higher levels of legumes or potatoes. Check your dog food ingredient label to see if these foods are present and where they fall in the list. Ingredients are listed in descending order according to weight on a dog food label. Legumes and potatoes are added to commercial dog food to boost the amount of protein. If they are high up on the list, do not feed additional legumes. If you discover your dog food contains more legumes than you are comfortable serving, You may also want to look into another type of food. Can Dogs Eat Asparagus and Broccoli? Cooked asparagus and broccoli can be offered in small amounts if your dog likes the taste. Consuming too much will cause gas, upset stomach and possibly diarrhea. Green beans are probably the number one vegetable that pet parents feed their dogs. Green beans are safe and should not be confused as being part of the bean and legume grouping that may be causing issues as reported by the FDA. Some herbs are also safe for dogs. These include parsley, sage, oregano, thyme, and basil. Spices like cinnamon, ginger, and turmeric are also excellent. Avoid onions, leeks, cocoa powder, and nutmeg. Dogs also do not need salt added to their food. The jury, in my mind, is still out when it comes to garlic. Some sources warn never to give garlic. My dogs have always been given small amounts of garlic for many years. My veterinarian back in the 1970s first introduced me to garlic and tooted it as an excellent remedy for fleas. The garlic changed the blood chemistry making it unpalatable for the fleas. That list of benefits sounds very impressive. However, on the other hand, According to the Merck Veterinary Manual, garlic and other members of the allium family, including onions, contain thiosulfate, which is toxic to dogs but not to people. Garlic, as it turns out, causes causes GI Upset including vomiting, diarrhea, abdominal pain, depression, and dehydration. Brussel sprouts contain vitamin K, C, A, B1, and B6 which makes them very nutritious both for you and for your dog. Many people report, though, that brussel sprouts give their Shih Tzu dogs gas, diarrhea or stomach distress. For this one, I would proceed with caution. Zucchini includes fiber, vitamins, and minerals and would make an excellent choice for a treat especially since a cup of raw zucchini only contains about 20 calories. 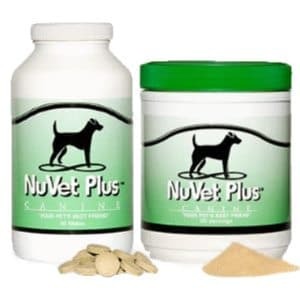 It’s low in fat and cholesterol and would be especially good for dogs with a weight problem. Adding fruits and vegetables to your Shih Tzu’s diet can have many benefits. If your pet is eating more fresh foods, it means they need less of the alternative, which is often highly processed, high calorie dog food. 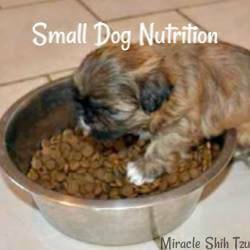 Additionally, fruits and veggies can supplement a Shih Tzus diet naturally, and give them all the nutrients they could need. As with any new food, fruits and veggies should be added slowly and in small quantities. Both fruits and veggies are full of vitamins and minerals but may cause some gas, stomach upset and diarrhea if given in too large of a volume. This article is meant to inform but not to replace the advice of your veterinarian. Some health issues may preclude serving specific types of vegetables so if your dog is being treated for any illness, always check with your veterinarian before offering any fruit or vegetables. Did you find this article about fruits and vegetables for a Shih Tzu interesting or helpful?